Meet the pigs who live their very own luxury lifestyle... on a beach in the Bahamas! 1. 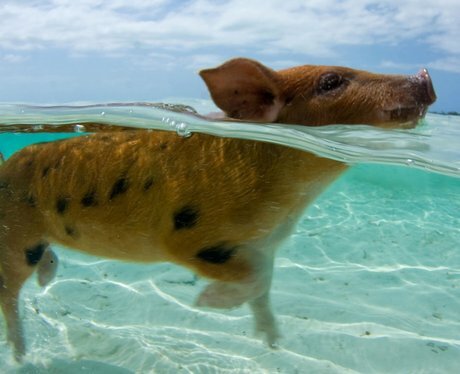 A wild pig bathes in the clear blue waters of the Caribbean Island. 2. Anyone up for building a sandcastle? 3. Now that's what we call a very happy pig! 4. A group of pigs take a break from the hot sun and enjoy an afternoon siesta. 6. Such a beach babe! 7. Photographer Jim Abernethy loves spending time capturing the pigs on their tropical island paradise. 8. "They uniquely live in complete harmony" says photographer Jim Abernethy. 9. "Fancy a morning dip my dear?" 10. Are we the only ones who are a tiny bit jealous?